DONT WRITE SIGNS UNDER THE INFLUENCE OF ALCOHOL! ! Don’t drink what you drive. If you drink, don’t drive and if you drive, make sure you have a car. Reminds me of that episode of M*A*S*H when Klinger tried to eat a Jeep. Don’t worry, I promise not to drink Ric Ocasek while I’m drunk. Or any other member of the band either. 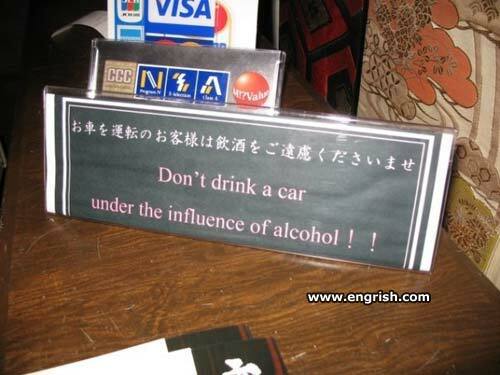 If you’ve gotten to the point where you’re even considering drinking a car, you’ve had enough already.